Glad to be a Girl: Meese, Anyone? Had a good weekend :) Varen & I went out for dinner with J9-double0blonde on Friday night, it has been ages since we saw her properly so it was nice to catch up. We ate at hanna b. in Greenside. The food was good, I just had a boring Chicken Prego roll. But they did give us free soups before our main meals. What a lovely idea in winter! On Saturday we had a busy day. Up and off to gym for both of us. Then scrambled eggs at home before Varen started building the bunny-hutch addition I had designed. Okay, so Lily has been burrowing up a storm in the garden and in the lucerne (currently stored in the old hutch which makes it easier to manage now that the bale has disintegrated). And as I mentioned, it has me worried about Rex not being neutered yet ... sigh. Anyhoo, we are also a little worried about them in the cold weather - although they are Northern Hemisphere animals. So I designed a "plug-in" for the hutch (and that folks is why I love my hutch design more and more every day!) 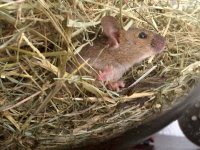 which is completely separate but gives them two hideaway boxes that we can fill with lucerne and they can cuddle and get warm in ... or burrow in if the need arises. Luckily it didn't cost us a cent as we just used wooden offcuts we already had :) So far they seem to be enjoying it ... although seeing Coal this morning made me worry that Lily might not actually be our problem. She was fetching bits of lucerne in her mouth and taking it into one of the boxes. Meep. I hope we don't have baby bunnies just yet. I could maybe manage one litter ... but if she's starting to nest now, that means we could well end up with more! Which I really do NOT want. So far as we've seen, he hasn't yet mounted either of them, so I'm still staying hopefully ... and checking him closely for the moment those walnuts appear so I can whisk him off to the vet! 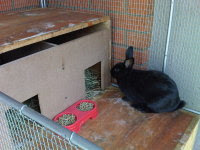 Right after the plug-in was built, we set about cleaning the hutch. 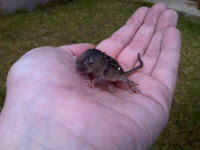 And while we were doing that we decided it was time to try catching our resident mice and take them to the field next door (no, that's not a euphemism, we will really be taking them to be set free in the field). We'd counted 8 last week, that's enough for me, and I'm sure we hadn't even counted them all! So when we were cleaning the stoep (patio), and the water rushed over into their holes, I ran about catching them - they'll really stupid little things, they run upstream. I caught all except one and we had 5 adults. So, I now have a huge family of mice living in an old giant fish bowl. Mostly they live outside, because we're still a little nervous they might jump out - they were certainly trying hard enough on Saturday afternoon! I'm also worried about them surviving to all be set free once the babies are older. They've got water and bunny food (and they even got a grape like the bunnies yesterday!) and they've got a pile of lucerne that they have burrowed into, so they seem fine. 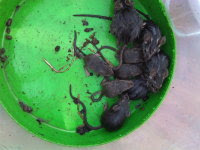 Anybody interested in pet mice, going free to a Joburg home with NO snakes. Or maybe your kid's school classroom wants them? Let me know. And then we relaxed for the rest of Saturday afternoon ... Varen was exhausted ;) And in the evening we headed off to the Civic to see John Vlismas' current show, POW! We decided to head off early and grab a bite to eat at the Newscafe there. Remind me to book next time! But luckily we did manage to get a table and have something to eat before the show started :) Meh, Newscafe. I really have no idea why it's so popular. The cocktails are average and overpriced, as is their food. The show was fab. Although I must admit that although he's one of my favourite SA Comedians, I last saw him (I think) in Grahamstown in '98. He's one of only two people in the world (Billy Connelly is the other) that I could listen to swear for an hour and a half straight and think it was the most brilliant show ever. There's just something about them. So it was super curious to see the show where he wasn't allowed to swear. I enjoyed it, and my cheeks hurt from laughter ... but I'll be honest and say I prefer him swearing. Varen thoroughly enjoyed it, it was the first time he'd seen John Vlismas perform. Judgment Day has come and gone, leveling modern civilisation. An army of Terminators roams the post-apocalyptic landscape, killing or collecting humans where they hide in the desolate cities and deserts. But small groups of survivors have organized into a Resistance, hiding in underground bunkers and striking when they can against an enemy force that vastly outnumbers them. Controlling the Terminators is the artificial intelligence network Skynet, which became self-aware 14 years earlier and, in the blink of an eye, turned on its creators, unleashing nuclear annihilation on an unsuspecting world. Only one man saw Judgment Day coming. One man, whose destiny has always been intertwined with the fate of human existence: John Connor. Now the world is on the brink of the future that Connor has been warned about all his life. But something totally new has shaken his belief that humanity stands a chance of winning this war: the appearance of Marcus Wright, a stranger from the past whose last memory is of being on death row before awakening in this strange, new world. Connor must decide whether Marcus can be trusted. But as Skynet adapts new strategies to end the Resistance forever, Connor and Marcus must find common ground to take a stand against the onslaught to infiltrate Skynet and meet the enemy head-on. Okay, so I'll be honest and say I haven't watched *any* of the other Terminator movies ... the most I knew about them was they stared Arnie and have the famous line: "I'll be back". But I figured the Star Trek movie was such a great movie, I'd give this one a try too. Wrong. And then we went home to relax for the rest of the weekend ... although it was only about 3pm, it felt much later and we were both in bed at 7pm. Which I'm telling myself is not that different than lazing in bed for a late morning ... right? I love that you saved the mice. You totally went up in my "awesome people" book. Some people would just kill them, and I hate that. The only thing I don't object to killing are insects. Double standards? Sure. But I freaking HATE bugs. Uh oh... baby bunnies eh? I wish I could watch comedian shows- but I giggle so much I have an asthma attack within 5 minutes, and then when I recover I start laughing again and then within 5 minutes I'm coughing again.